Glasgow’s Kelvingrove Art Gallery is hosting a photo exhibition of adults with Congenital Heart Disease (CHD) baring their scars in celebration of life, led by psychologist Dr Liza Morton. Scarred FOR Life was created on behalf of heart charity The Somerville Foundation by three friends with CHD: Liza Morton (see The Psychologist, September 2013), Caroline Wilson and Jenny Kumar. The exhibition aims to raise awareness of how the often invisible condition impacts on adult life through participants’ stories. Fashion and portrait photographer Kirsty Anderson joined the team to transform the participants into works of art. The Somerville Foundation aims to provide practical and emotional support, enabling survivors to take control of their lives and manage their condition. In addition to empowering people with CHD and raising awareness about their unique needs, the campaign hopes to raise funds for this work. Like most image-conscious teenagers, when it came to choosing an outfit for any special occasion I coveted something both flattering and fashionable. But more pressing was that it would hide the tracks that run from my breastbone to my back where surgeons had fitted pacemakers, throughout my childhood, beneath my ribs to my growing heart. Any outfit also needed a neckline high enough to cover the vertical line marking where my breastbone was opened, aged 12, to mend the hole in my heart, and straps wide enough to hide the messy site, beneath my left collarbone, that has hosted various pacemakers since my early teens. Although I was born with a heart condition, I did not wear the scars that prove it with pride and instead feared they were evidence that I was unforgivably different from my peers. 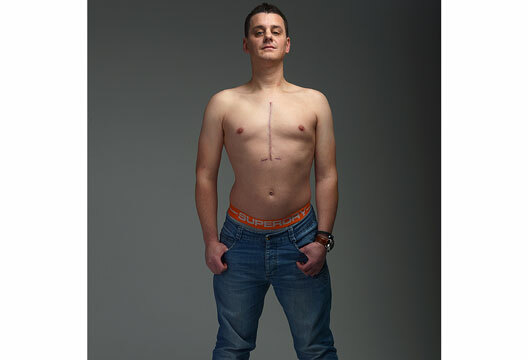 Yet, earlier this year I was one of eight adults born with a heart condition bearing my scars for a photography exhibition in the Central Hall of Glasgow’s Kelvingrove Art Gallery & Museum. The story of each model’s journey navigating the complexity of living with this condition, in our own words, was written on the reverse of our eight-foot high photo banners to give voice to and empower this often hidden population (see www.scarredforlife.org.uk). Congenital heart disease (CHD) describes any heart condition present from birth. The most common complex birth defect, which affects 1 in 125 babies, includes a wide variety of conditions varying in severity. Advances in medicine over the last 50 years have ensured that more people with this condition are surviving longer than ever before. In the 1940s, only 20 per cent of infants born with a heart condition survived, whereas today around 90 per cent are now reaching adulthood with an estimated 250,000 adults with CHD in the UK (Warnes et al., 2001). However, many will experience medical, psychological and social problems at some time in their adult lives (Morton, 2014; Verstappen et al., 2006; Wray et al., 2012). The idea for The Somerville Foundation’s exhibition ‘Scarred FOR Life’ emerged from a conversation I had with two friends, Jenny Kumar and Caroline Wilson, about the need for improved awareness about the heart condition(s) we had each lived with since birth. To this end, it surpassed our hopes with coverage in most national and local newspapers and both the Scottish BBC and STV news and radio. One of the main aims of the project was to challenge the perception that scars should be hidden away. Fashion and portrait photographer Kirsty Anderson sensitively captured portraits of us displaying our scars as a symbol of survival. To this end, it has been moving to witness how positively the exhibition has been received with sensitive media coverage and encouraging responses from visitors who were able to speak for themselves by commenting in a visitors’ book. We hope this exhibition has been able to use art informed by psychology to challenge negative perceptions about scars and in doing so help to empower adults born with a heart condition and maybe even have a wider impact on prevailing cultural ideals about body image. As a teenager, I would certainly have benefited from role models to make me feel more comfortable with my scars, and my involvement in this project has liberated me by overwhelmingly changing my relationship with them for the better. I might even wear, for the first time, a strapless top this summer (in the rare hope that the Scottish weather permits!). The exhibition moves to the Forth Valley Royal Hospital in June and then to the Scottish Parliament in October. We are open to any ideas or offers to get our message out there. Morton, L. (2012). Healing hearts and minds. The Psychologist, 26(9), 694–695. Verstappen, A., Pearson, D. & Kovacs, A.H. (2006). Adult congenital heart disease: The patient’s perspective. Cardiology Clinics, 24, 515–529. Warnes, C.A., Liberthson, R., Danielson, G.K. et al. (2001). Task Force 1: The changing profile of congenital heart disease in adult life. Journal of the American College of Cardiology, 37, 1170–1175.